Established in Thiers in 1859, Fischer Bargoin is one of the leading manufacturers in France of industrial cutlery, but their name is not as well known in consumer markets. The Zen line of chef's knives is Fishcher Bargoin's top-of-the-line range for professional chef's. Designed in conjuction with Michelin-starred French chef Cyrille Zen, the Zen line is ergonomic and durable enough to be used all day, every day. The knives of the Fischer Bargoin Zen line offer practical contemporary design, comfortable handling, and excellent balance. The Zen knives use Sandvik 14C28 stainless steel (Chromium Manganese X62CrMn14), hardened to Rockwell 61. This is harder than most European knives, which means that they will hold an edge longer, but are slightly more difficult to sharpen. Japanese knives tend to be even harder, but with the tradeoff that they are considerably more brittle, and more difficult to sharpen. Fischer Bargoin settled on 61 as the ideal compromise and in our testing we have found it to be an excellent choice. This line has excelled in every regard in our internal testing. 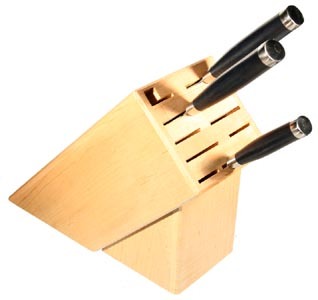 The handles are made from Micarta, a synthetic material that is durable and water resistant. Like any fine knife, this knife should never be put through a dishwasher. However, unlike most wooden handled knives, this handle will survive it. Blade: 10cm - (4") SALE! Blade: 19cm - (7 1/2") SALE! Blade: 15cm - (6") SALE! Blade: 20cm - (8") SALE! Blade: 30cm - (12") SALE! 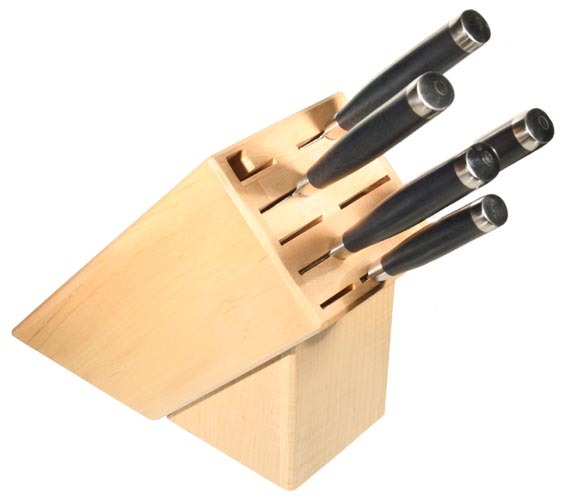 Includes: Paring Knife, 8" Chef's Knife, 10" Bread Knife and 11 Slot US made Maple Block. SALE!